2018 Taiwan Lantern Festival will be held at Chiayi County (near National Palace Museum south branch and HSR Chiayi Station). The 2018 Taiwan Lantern Festival is going to present itself via water, on the land, and in the air. Bringing together tourism, technology, culture and art, the festival is expected to manifest Chiayi County’s renewed traditions and creativity as a ground-breaking “smart” event. The “water” lantern zone features water and light shows which are in par with international standards on the globally famous sea of clouds, sunrise, forest railways and cherry blossoms of Alishan, in addition to a presentation of the water landscape and architecture of the Southern Branch, National Palace Museum located right in Chiayi. The shows will take place at fixed hours every evening during the festival period, as accompanied by dance performances by professional troupes. The “land” lantern zone delves into Chiayi history, highlighting traditional craft art and the works by local artists. New ideas are instilled into this otherwise traditional lantern display in an artistic way. The “air” lantern zone shows high-tech lanterns made with new technology, materials and techniques. These lanterns look truly different. Chiayi is planning to build an innovative lantern festival. Added with technological, artistic and cultural elements, each of the displays is unique and worth some discussions. Please look forward to this one-and-only event! This is always the biggest and the most crowded. The nearby Yanshui township in Tainan also hosts Yuejin Lantern Festival, this one tend to collect contemporary art style work. You can also witness the infamous "beehive fireworks" if you go on the right day. The information 2018 is yet to come. Pingxi is famous for its sky lantern. Again the date for 2018 is yet to be announced. Yeliu near Taipei also supposedly has a good festival, with firewalking and carrying a palanquin into the sea. Large cities such as Taipei and Kaohsiung also host their own festival each year. Click here to join Taiwan Holiday's 2018 Taiwan Lantern Festival group tour that will amaze you! The Lantern Festival is celebrated annually on the 15th day of the first lunar month to mark the grand finale of the Chinese New Year celebrations. It is also the very first full moon day of the New Year, symbolizing the coming of the spring. People usually celebrate this festival by enjoying family dinner together, eating Yuanxiao (glutinous rice dumpling), carrying paper lanterns, and solving the riddles on the lanterns. The festival is celebrated with fanfare events in Taiwan, including the internationally famed Pingxi Sky Lantern Festival in New Taipei City, Bombing Lord Han Dan in Taitung, and Yanshui Beehive Rockets Festival in Tainan, to welcome the New Year in a spirit of peace, prosperity and joy. 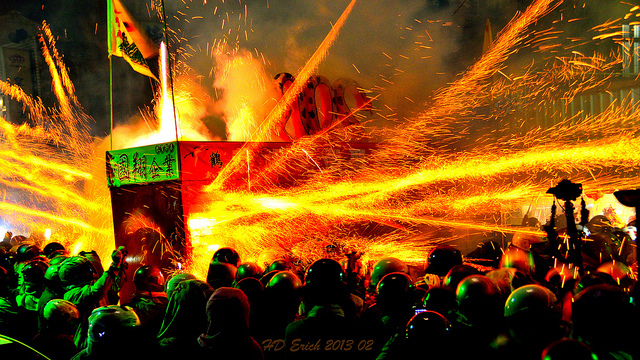 Bombing Lord Han Dan is a special ceremony in Taitung, which a chosen man performs in the role of Master Han Dan-a god of wealth, and gets thrown by firecrackers. During the event, the chosen man wears nothing but a pair of red short pants, holds one bamboo fan to protect his face, stands on a sedan chair, and being carried around by four devotees. Firecrackers are to be thrown at the chosen one as it is believed that Lord Han Dan cannot bear the cold weather. The firecrackers are to keep him warm as well as to pray for wealth and prosperities. Pingxi Sky Lantern Festival is held every year during the Lantern Festival in Pingxi of New Taipei City. Sky Lanterns, also known as Kongming Lantern are flying paper lanterns traditionally found in some Asian cultures. It was invented by Kongming during three kingdoms period by Zhu Ke-Liang (aka Kongming) in order to pass military information. They are constructed from oiled rice paper on a bamboo made frame, and contain a small candle or fuel cell composed of a waxy flammable material. After lit, the flame heats the air inside the lantern, same concept of a hot air balloon which raises the lantern into the sky. People nowadays usually write their wishes on the sky lanterns because it is believed as the lantern fly into the sky; it is a way to pass on your wishes to gods above. Yanshui Beehive Rocket Festival is a distinctive religious event scheduled on the day of the Lantern Festival in Yanshui, Tainan. On the day of the Lantern Festival, people would visit Yanshui in Tainan City to follow the sedan chair of the divinity and the release of thousands of firecrackers. Participants are required to wear a helmet, mask, towel, as well as dressed in long pants and long sleeves shirt for safety. TAIPEI (Taiwan News) -- While the official Lantern Festival (元宵節, Yuan Xiao Jie) falls on February 11—the first full moon and 15th day of the lunar year, marking the end of New Year celebrations—Taiwan has celebrations throughout February at different locations to allow tourists and residents an opportunity to experience the holiday festivities in different towns. The Lantern Festival dates back to at least the Western Han Dynasty (206 BC-AD 25), though the origin is traced to multiple legends. While carrying colorful lanterns on the evening of the festival is the main event, it's also a tradition to eat tangyuan (湯圓)—sweet or savory glutinous rice balls. 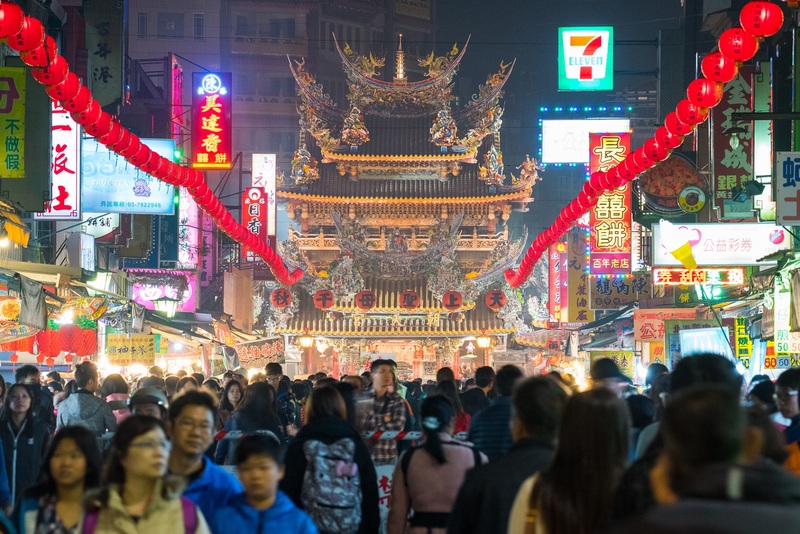 While the Lantern Festival can be celebrated anywhere in Taiwan, there are a few larger celebrations for tourists and residents to experience. When people talk about Lantern Festival in Taiwan, the first place that comes to mind is Pingxi (平溪), which will host its event from February 11 to 19 this year. 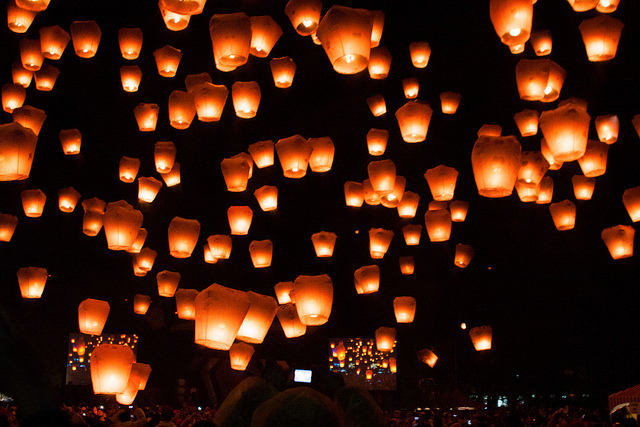 There will be a second Sky Lantern Festival on October 4 to celebrate the Mid-Autumn Festival. On February 11th starting at 10 am, free lantern releasing tickets will be handed out. Lanterns will be released at 6 and 7 pm on the February 11. Pingxi, just west of Taipei, is renowned for its sky lanterns (天燈), with more than 100,000 sky lanterns launched during the festival in 2013. The town was selected among National Geographic magazine’s “Best Winter Trips 2016.” In previous years it has been recommended by CNN and Fodor’s. Legends claim that the sky lantern, so named because it rises in the air due to a small flame placed inside, was invented by Zhuge Liang during the Three Kingdoms period (AD 220-265). While it was originally used for military purposes, it grew in popularity. The sky lantern became a part of Lantern Festival celebrations in Taiwan in the early 19th century. Today, people write wishes for the new year on the large lanterns before releasing them. The festival has received criticism as the sky lanterns return to earth and residents are left to clean up the debris in the rivers and fields. However, the town has cleanup crews on hand during the festival to assist with retrieving the lanterns. The lanterns are available year-round for visitors who prefer to avoid the crowd during the festival, but cleanup crews are not on hand the rest of the year. The Lantern Festival was first held in the capital city in 1990 as the national lantern festival until 2001. This year's Taipei Lantern Festival has selected the theme "West Side Story, Taipei Glory" and will take place from February 4 to 17. The festival will kick off around Beimen on Sec. 1 Zhonghua Rd. with a lighting ceremony at 6 pm. The celebration will feature traditional lantern displays and a high-tech showcase of projection and illumination technology on historical sites and buildings. The Japanese band World Order will perform on February 4 and 5 at the Main Display Area at Ximending. The lantern zones will span several areas around Beimen and along Zhonghua Road, and include a main display area, light sculpture area, landscape creativity area, Universiade interactive area, blessing lantern area, freestyle creativity area, student creativity area and a friendly exchange area featuring lanterns sponsored by private businesses and foreign representative offices and nations. In its 27th year, the Yunlin Lantern Festival will be held from February 11 to 19, with the entrance to the event at the Yunlin High Speed Rail Station. It will be the largest festival in the municipality's history, covering 50 hectares. This year's celebration is also host to the Taiwan Lantern Festival, which the Tourism Bureau began in 1990 in Taipei and has rotated through counties since 2001. This year's slogan for the event is "Auspicious Rooster Soars Among the Clouds." 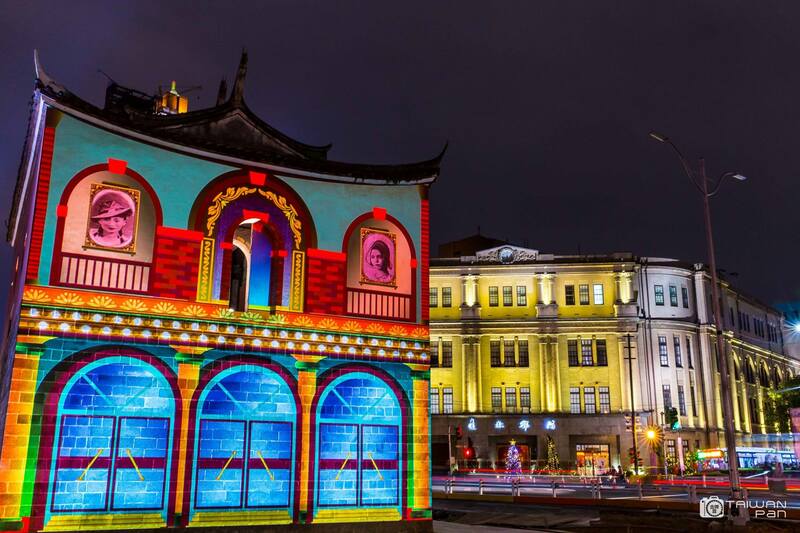 The festival theme "Lantern Festival blended into the City" will feature 19 light-themed and decorated areas to connect the Lantern Festival with Yunlin County. These areas will lead visitors through Yunlin (Huashan) Gukeng Coffee Park, the winter corridor with blooming red cotton trees and the wetland fishing village, among others. According to organizers, "it is a series of activities that showcase the LOHAS spirit, hometown nostalgia, traditional arts and crafts, and prayer for happiness and safety in the new year." 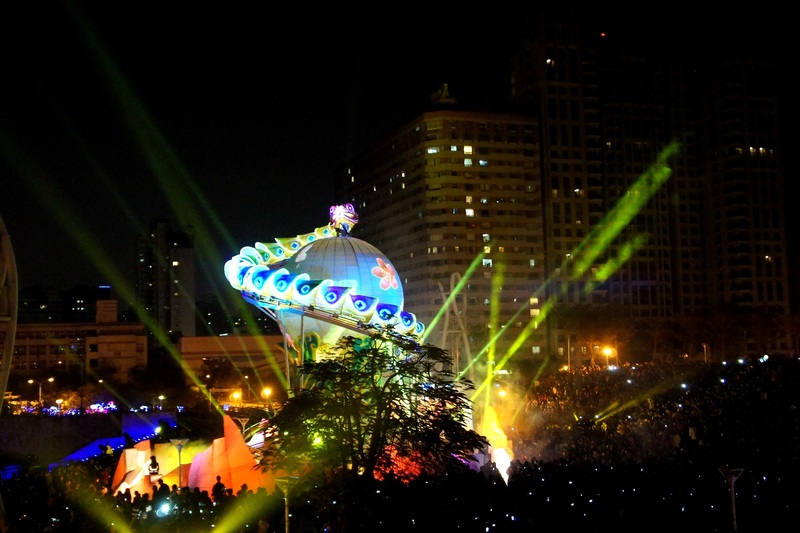 Started in 2001, Kaohsiung's Lantern Festival festivities are held along Love River. This year's festival began on January 30 and will last until February 12. The main celebration will be held on February 11. It features daily fireworks displays, light and dancing fountain shows, as well as musical performances. The fireworks displays will be at 7 and 9 pm, while the light and dancing fountain shows will be staged from 7 to 10 pm with each show lasting 30 minutes. 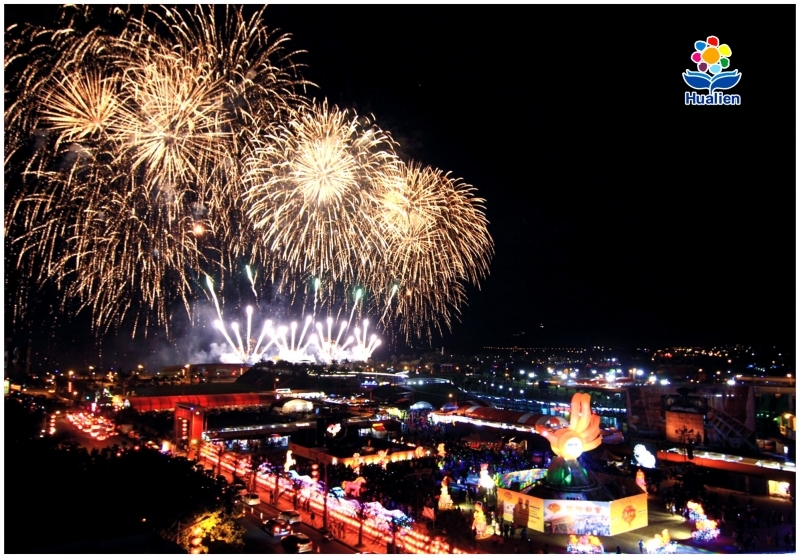 Though Taitung foregoes the lanterns, it still hosts the Bombing of Master Handan (炸寒單), which began in 1954 as part of its Lantern Festival celebrations. In Taiwanese folklore the Handan is a god of wealth and war. 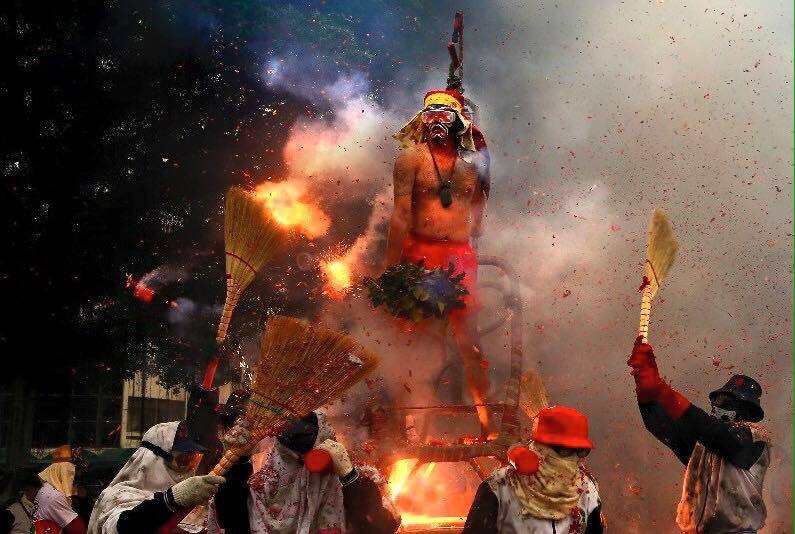 He is also afraid of the cold, so the firecrackers are set off around a man playing the part of the god, which is paraded around town by volunteers, in an effort to warm him. The volunteers carrying the "Handan" wear only a red headscarf, an amulet and red shorts (and safety goggles). The celebration had been banned for years due its connection to organized crime in the area, but it is now officially recognized by the government. 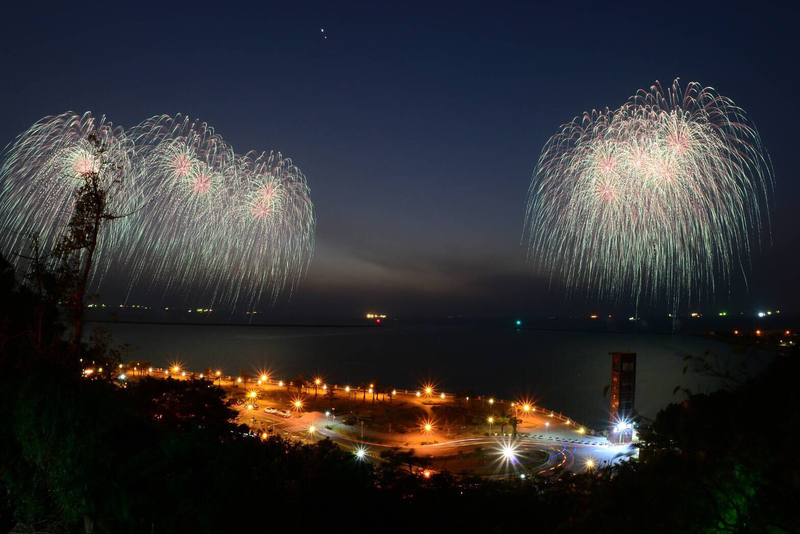 The city expects this year's festival to draw its largest crowd, with a target of about 600,000 attendees, at Yuejin Port in Yanshui District (鹽水). The celebration will include dance performances, concerts, art and light installations, and movie screenings throughout the area. And there will be the famous "beehive" fireworks at Yanshui Wu Miao Temple. The event will run all month, with the larger performances and celebrations on Feb. 11. This year's celebration will feature 50 art installations, including an illuminated artificial bamboo forest maze titled Yuemijin (月迷津) by Taiwanese artist Yu Wen-fu. The festival will be held at Taichung Park and Taichung City Seaport Art Center from Feb. 5 to 19, with the theme "Blooming Phoenix." Lanterns will be lit each night between 6 and 10 pm and the celebration will include interactive lantern displays as well as plenty of local cuisine. Penghu retains many traditions in its Lantern Festival celebrations, instead of attracting visitors with contemporary art installations and light shows like other destinations in Taiwan. Residents of Penghu will partake in the qigui (乞龜) practice—praying to turtles (平安龜) at temples as they symbolize longevity and good luck. Festivities will run throughout the month and will include a rice noodle feast on Feb. 27. Hualien began celebrating on Jan. 21 and will continue until Feb. 19. Festivities will be held along Zhongshan Rd. by Dongdamen Night Market with additional celebrations at Liyu Lake (鯉魚潭) in Shoufeng Township, which will feature a giant red-faced duck. The main light show in Hualien will be held every half hour between 6:30 and 9:30 pm along with a water and light show every half hour from 6:45 to 9:45. In Shoufeng, performances will be held every half hour from 2 to 4 p.m. and 6:30 to 9 p.m. While Ciyou Temple, dedicated to the Taoist goddess Mazu/Matsu (天上聖母), the sea goddess, is generally more popular for the first day of the Lunar New Year, it also hosts its own Lantern Festival celebration on Feb. 11. The Lantern Festival celebration begins at 4 pm and will include musical performances.